* Using ING’s International Survey, Ian Bright—Group Research Managing Director at ING and Jessica Exton—Behavioural Scientist at ING, discuss international attitudes towards homes and mortgages. The ING International Survey is one of the largest and longest-running surveys of its type in Europe. Hites Ahir: ING has been conducting a regular annual survey called—ING International Survey of Homes and Mortgages since 2013. Could you tell us a bit about this survey? Ian Bright and Jessica Exton: The ING International Survey on homes and mortgages is one of three surveys carried out each year to better understand how people around the globe spend, save, invest and feel about money. The other two surveys cover consumer attitudes to saving and investment, and mobile banking and new technology. ING’s International Consumer Economics team, embedded in ING’s Group Research department in London, works with 13 of ING’s retail business units across Europe, as well as the United States and Australia, to deliver these surveys. Around 1,000 people in 15 countries (500 in Luxembourg) are surveyed online by Ipsos, giving a sample of about 15,000. Hites Ahir: What are the main messages coming out from this year’s reports released in September and October? Ian Bright and Jessica Exton: This year’s homes and mortgages survey was split into two reports. The September report noted the increasing unaffordability of housing for many people. Affordability challenges contribute to the 35 percent of non-owners in Europe who say they don’t ever expect to buy a house. Discussion about housing often focuses on local or national elements. Yet the perception that housing is expensive in many countries suggests global factors play a role too. Many told us they consider the housing market in their country to be on the wrong track. The October report focused on consumer attitudes to the environmental aspects of housing. Once again affordability is the biggest challenge preventing people from doing more to reduce the environmental impact of living in their homes. 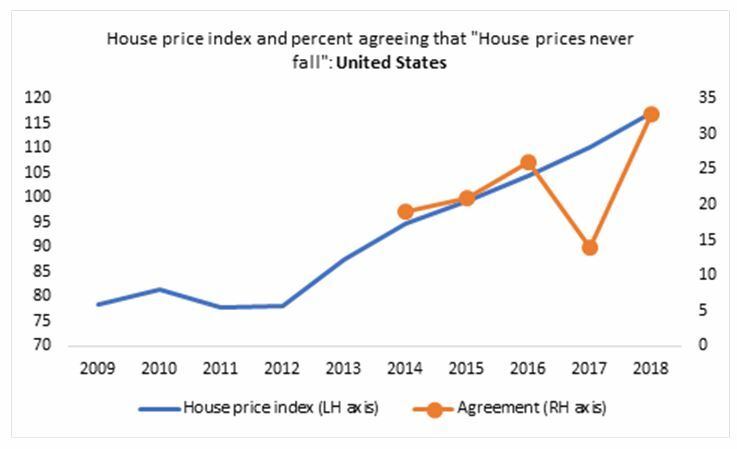 Hites Ahir: “Many continue to feel that house prices never fall”—this is a quote from the findings of this year’s survey of September. Here is another quote from the 2017 survey: “A third still believe that house prices never fall”. And here is one more quote from the 2016 survey: “People still believe that house prices never fall”. What could explain this view in markets that have recently experienced a bust? Ian Bright and Jessica Exton: This is one of the most disturbing results from our survey: a result that we have found again and again each year. We first asked consumers how much they agree or disagree with this question in 2014 and have asked it every year since. Originally we thought this was a throwaway line that would be wholeheartedly rejected. We have been proved wrong repeatedly. When presented with the statement “house prices never fall” about 40 percent of respondents across the 13 European countries consistently “agree” or “strongly agree”. The responses vary between countries but seem to increase if house prices rose in the immediate past. Consumers don’t appear to take long-run trends into account. One explanation for this may be that myopia takes hold fairly quickly once prices start rising from a trough. We may expect trends to continue given the salience of recent events. This myopia may extend beyond a time element and have a neighbourhood element as well. If house prices in your immediate area did not fall while prices elsewhere did, you may feel immune from national or wider economic effects. Another explanation for this may be how people interpret the term ‘never’. Defined strictly, “never” means no chance of occurring. However, many consumers may interpret “never” as simply meaning “very unlikely”. For example, in the Netherlands, agreement virtually tripled from 11 percent in 2014 to 30 percent in 2016 (Figure 1). This was despite persistent price falls in the five immediately preceding years and with the national house price index at the start of 2016 still 14 percent below the mid-2008 peak. We see this V-shape between 2016 and 2018 because people were given slightly different answer options in different surveys. But the trends remain consistent. For the first three years, respondents could either agree, disagree or choose “do not know”. In 2017, we replaced “do not know” with “neither agree or disagree”, and in 2018 we included both of these options. Responses have jumped back up to similar levels this year. We see a similar pattern in the United States and Spain (Figure 2 and 3). Hites Ahir: What is the implication of the expectation that prices will continue to rise? Ian Bright and Jessica Exton: The evidence suggests many underestimate the risks associated with buying a house: prices can go down as well as up, for example. And it’s not just price risk that is relevant. Other risks people might fail to take into account when making a purchase decision include changes in interest rates that will impact loan repayments, the high opportunity cost of tying equity into a home and additional costs associated with home ownership such as repairs and insurance. This suggests people need a clear understanding of not only the risks associated with taking out a mortgage but also with the broader experience of home ownership. Financial institutions have a role to play here. However, this may be a challenge. There is evidence that people don’t trust banks in some contexts while at the same time our surveys continually find that people on average are open to assistance from their specific bank. In other words, ‘banks’ in general may not be trusted but ‘my bank’ may have a higher level of trust. However, the same 2014 survey found that when trouble strikes and a person can no longer pay their mortgage, they expect their bank to help. Thirty-six percent believed the best approach would be for the lender to offer more time to pay and 23 percent that a repayment holiday should be made available. In the same survey 73 percent agreed that the primary responsibility for financial decisions lay with them but just 35 percent agreed deciding the right mortgage value was their responsibility. 41 percent agreed that this was the responsibility of both themselves and their bank. Hites Ahir: Bob Shiller has argued that when looking at the aggregate level and over the long term, housing has not been a great place to invest money. Yet your latest survey finds that “71 percent still agree it’s better to own a property”. How do you reconcile these two different views? Ian Bright and Jessica Exton: Regardless of what academics and studies report, we find high shares across Europe believe that buying a home is better financially than renting. In our 2017 ‘Renting vs Owning’ report, 68 percent of respondents living in Europe agreed with the statement “buying is a smart money decision”. Just 8 percent said the same about renting. Sixty-six percent, the same year, said “everyone would buy if they could afford to”. Based on these responses, people don’t appear to anticipate monetary loss through property ownership. What’s more, buying a house is not purely a financial decision. Housing is an aspirational good. Asked in the 2017 survey to think about symbols of success when it comes to housing, 65 percent across Europe identified buying compared with only four percent for renting. Only 23 percent answered neither. In the same survey 60 percent of those renting would prefer to own. For owners, only 11 percent would like to rent. Evidence from our surveys suggest elements of bubble mentality continue to affect people’s perceptions of housing. Over several years, respondents have been asked whether they believe houses where they live are expensive or cheap. They have also been asked separately whether they expect house prices to rise or fall in the next 12 months. A majority in Europe consider houses where they live to be expensive. However 39 percent of these people also expect house prices to rise in the next 12 months (Figure 4). By implication, they believe houses will become even more expensive. It may be rational to think that expensive products will become more costly over time. But another explanation may be a persistent shortage of supply compared with demand, which is consistent with dysfunctional housing markets. People may feel caught in a trap, considering houses to be expensive but with no other option but to buy given they believe house prices are going to rise even further. The evidence points to strong price momentum in housing. And as we suggested before, it may also reflect the persistence of bubble psychology if we follow Shiller’s definition of a bubble. Hites Ahir: How does the finding that “house prices never fall” change if you group the responses by boom, post boom, and markets where house prices have been stable? Ian Bright and Jessica Exton: We have not been able to consistently group countries and their agreement to this statement based on boom and post-boom markets. Post boom effects are felt differently across countries. 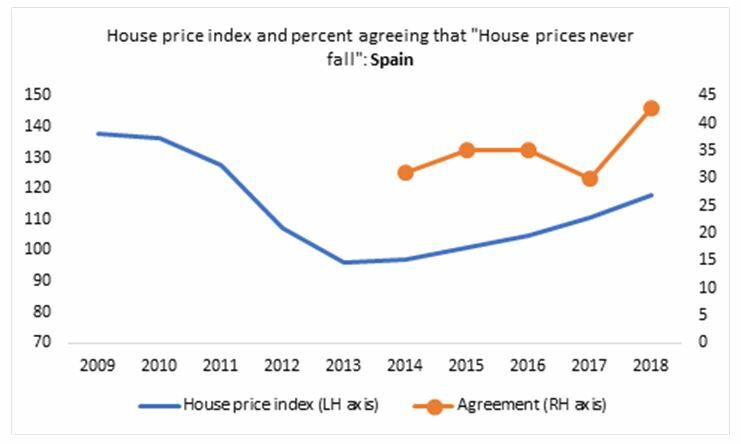 For example, Spain has seen a volatile housing market over the past decade yet between 2014 and 2018, agreement with the statement that “house prices never fall”, did not fall below 30 percent; it was 43 percent in the latest survey (2018). Conversely, in Australia, where house prices have been booming until this year, agreement was stable from 2015 to 2018, at between 28 to 33 percent. One thing that was surprising in the latest survey was the high percentage of people who not only agreed with the statement but chose “strongly agree”. Across Europe as a whole, 19 percent strongly agreed, and the share was highest in Luxembourg at 39 percent and Turkey at 35 percent. Hites Ahir: Let’s turn to the survey’s findings related to housing affordability. One of the questions in the survey is: what is the main reason you don’t expect to be able to buy a property? What do you find for boom, post boom, and stable markets? Ian Bright and Jessica Exton: Of those who have never owned a property, 35 percent across Europe don’t expect to be able to buy. The main reason given by 56 percent was insufficient income but 19 percent replied prices will remain too high and 16 percent indicated a lack of long term job security. That said there was noticeable differences between some countries. 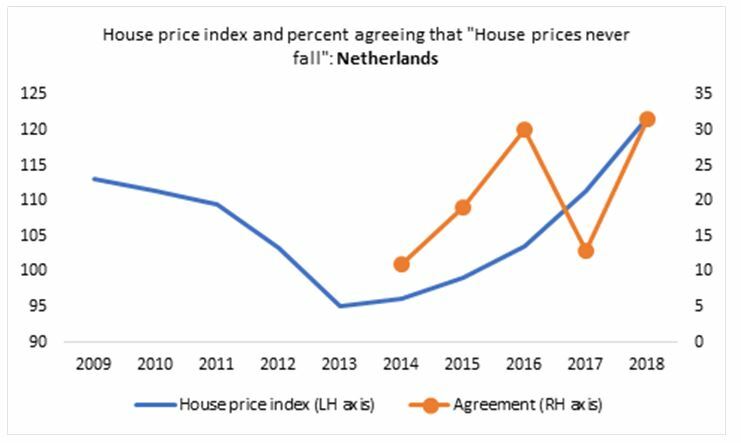 Countries where national house prices have been increasing rapidly, such as Luxembourg and the United Kingdom were more inclined to respond that price were too high, with 54 percent and 31 percent giving this as their main reason. In Luxembourg, it was the most common response and insufficient income was mentioned by fewer than half in both these countries. A concern that prices would stay too high, was the second most cited response after insufficient income, for ten of the 15 countries surveyed. Italy, where housing could be considered in a post boom period, stood out with 40 percent noting a lack of long term job security as the main reason. Hites Ahir: At what age are people buying their first property? Ian Bright and Jessica Exton: The 2018 survey showed the age at which people buy their first home varies noticeably between countries. 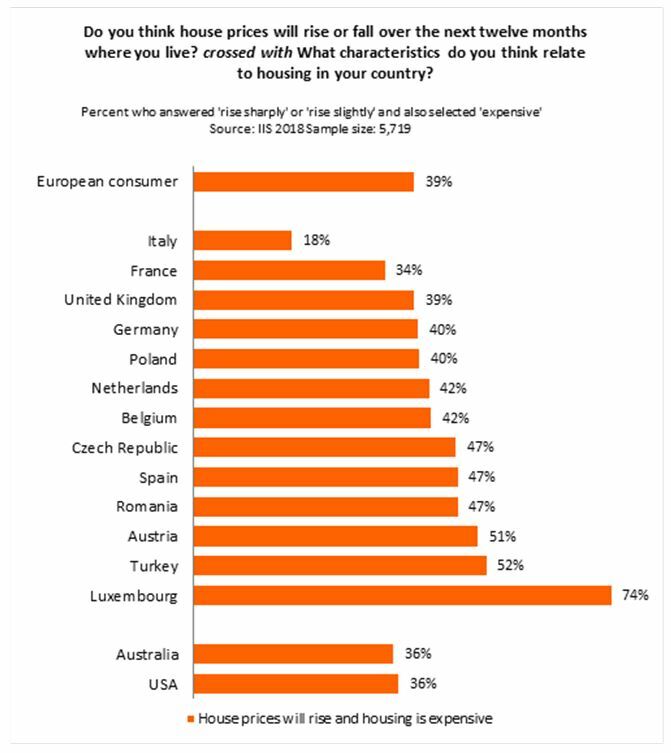 Across Europe in general 60 percent of those who currently own bought before the age of 30, but this varies from a low of 46 percent in Germany to highs of 76 percent in the United Kingdom, 71 percent in Spain and 70 percent in the Netherlands. The figures for Australia and the United States are towards the upper end of the European distribution at 72 percent and 67 percent. However, there is evidence younger people expect to buy their first home at an older age in future. Across Europe, of those aged 18 to 24 who do not own a property, only 34 percent expect to buy by the time they are 30. Only 39 percent of young Australians and 42 percent of Americans expect to buy before 30. This indication of increasing difficulty in buying a property fits with responses from the 2018 survey which found 72 percent across Europe (64 percent in the United States and 78 percent in Australia) agree with the statement “For newcomers to the housing market, it is increasingly difficult to buy a house.” Similar results were seen when we asked this question in 2015. Arguably this opinion contributed to responses in 2015 that found 72 percent across Europe agreed with the statement “It would be good for society if house prices fell”. Renters at 78 percent were more likely to agree but 69 percent of home owners also agreed. Hites Ahir: What do people think about the housing situation in their country? Ian Bright and Jessica Exton: More than half (53 percent) across Europe consider housing in their country to be on the wrong track, according to the 2018 survey. That was up from 45 percent in 2017. In none of the 15 countries surveyed in either 2017 or 2018 does a majority consider housing to be on the right track. This year discontent was expressed most in Turkey with 69 percent considering housing to be on the wrong track, closely followed by Spain at 68 percent. Housing was most likely to be considered to be on the right track in Poland at 39 percent and the United States at 36 percent. People were left to interpret right and wrong track for themselves. However, responses from this and previous surveys suggest continued high house prices and increasing difficulty for younger generations to buy a property are contributors to this dissatisfaction.